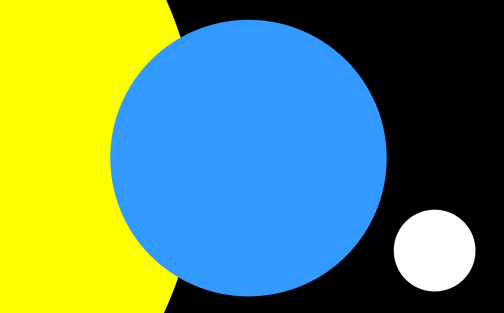 The Flag of Earth symbolizes the Earth (the center blue disk), the Sun (the yellow disk on the left), and the Moon (the white disk on the right). The Earth and its most important celestial neighbors – the Sun and Moon – are overlaid on a backdrop of the darkness of space. The Flag of Earth website is administered by NAAPO – the North American Astrophysical Observatory. NAAPO is a not-for-profit organization formed to run the Big Ear Radio Observatory in Delaware, Ohio, and which now runs the Ohio Argus Array. Makes sense but it’s ugly. It’s perfect. I want one. No daggers or fangs through it at all. It looks so harmless. Let’s spread a rumor that this is the World Federation flag, and that they’re going to confiscate guns and replace the dollar with the Federo, which is backed by stem cells from aborted fetuses. Pshaw. Is this just some Ohio observatory with ideas above its station? *wikis* Nope, some Illinois farmer. And SETI have apparently taken a shine to it. What’s the primary function of a flag? To differentiate your piece of land from your neighbor’s, I’d say. Also, wouldn’t any lifebearing planet be mostly water and consider its sun the most prominent nearby celestial body? If this is what we identify ourselves with when the Gamorrans come to sell their services as janitor/mercenaries, I’m kicking you all off Team Humanity. Appalling heraldry. Breaks the law of tincture, and is completely unblazonable. Dreadful piece of work. We still need a flag for Antartica, dammit. why does earth need a flag? All it needs is a big fat red maple leaf emblazoned on it, to represent the day when Canada conquers the planet with our secret super-inuit snow army. I want one too. It makes sense in an astrophysical way! What an awful piece of dross. Typical work by techies with no sense of design. My ten year old daughter would do better with MS Paint. Love it. I’ve been flying it for years — ever since I saw it in “Odyssey,” the astronomy magazine for kids, back in the early ’80s. Simple, clean, elegant design that anyone on Earth will instantly recognize and understand, no explanation needed. It was designed by a midwestern farmer named James Cadle circa 1970; when he passed away recently, he bequeathed the design to the public domain. “Why does earth need a flag?” Simple: To remind people that we’re all in this together. It would look good as a shoulder patch on a spacesuit. Missing leeches. No good without slimy parasitic bloodsuckers. Massive fail. Yeah, it isn’t the prettiest thing I ever saw. But out of the ones I saw on PhilWai’s link, it is the best out of those designs, IMHO. Great! If only stupid humanity could see themselves as Earthlings and stop fighting about the differences between them. One flag for one world. I think we all know that the American flag is the flag of earth, right? Isn’t it? Isn’t it…? Rosebud é o Trenó! | O blog pra quem sabe que Norman Bates é a mãe, o Bruce Willis está morto no final, Tyler Durden é coisa da sua cabeça e, claro, Rosebud é o trenó! The concept is beautiful. The design was obviously done by someone who hasn’t got a lot of experience. It took me about half a minute to rearrange the elements slightly so they look a lot better and more like a proper flag. I guess a committed designer could make the idea work wonderfully. As a designer, I love the idea. It looks fresh and innovative as a flag, and sets apart from old school typical flags. I’ve seen other entries of other “earth” flags and I still think this is the best one. My only beef is where that bloody moon is placed… it’s very awkwardly placed. People with a design sense would agree, its white circle just jumps too much and not leaving enough space on the flag… it’s just too close to a corner. My suggestion: move the white moon up a little more overlaping partially on the blue earth, similiar how the earth overlaps the sun. I think it would look far better and pleasing on the eye. Terra overlapping Sol creates the optical illusion that the sun comes to a point at one side. I’d have the curve of the sun farther over on the edge. I’d place the moon in the top corner, as we associate it with “up.” But I get the concept of there being no up or down in space. I like the Fibitz one, as well, but the crescent should be waxing, or a full moon. Waning looks too much like a particular religion. You know, I think I’d rather my planet’s flag be designed by a farmer than a graphic designer. And you’d rather have your planet’s hymn composed by a hard-working coalminer rather than a composer, I guess. Before further discussion, it would be useful for everyone to read about the history and background of the Flag of Earth. Some of the comments here have not been as completely informed as they might be. I came up with the same idea on my very own therefore I think this flag is awesome. I love the boldness of it, simple bold shapes. And the colors are totally unique for a flag which surprises me. It could use some tweeking however.